Its been a busy week in the publishing world. I have received some wonderful new books in the post, which you NEED to know about! 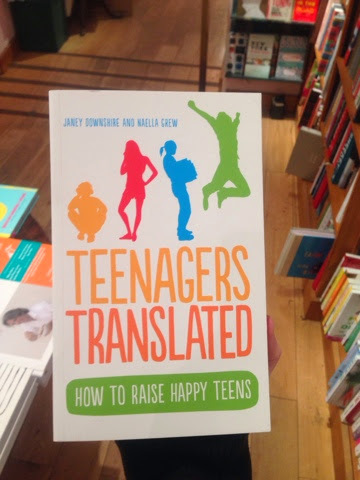 Firstly - Teenagers Translated by Janey Downshire and Naella Grew. This is, frankly, a must have BIBLE for all parents and teachers. And anyone who works with children and young people. I am not a parent but I attended one of Janey and Naella's courses a couple of years ago and it is clear that they are highly experienced and knowledgable in this area. They are both parents of teenagers themselves - and therefore they know the ups and downs of being a teenager and what its like to be a parent of one..! I am so pleased they have written a book - their wealth of knowledge needed to be available to everyone. Every chapter is useful, easy to understand and their advice and ideas are realistic and easy to put into practice. I particularly enjoyed Chapter 2 "The Teenage Emotional Roller Coaster". Chapter 7 is also highly relevant "What is going on in the digital and technical world?" since most young people are addicted to either a computer screen or mobile phone..
No parent is given a manual when their child is born to help them with what to do and how to cope... but now there is this one! This is the kind of book my parents wish they had read 20 years ago. I honestly haven't been so excited about a new book since the publication of Sane New World last year - and that is still on the best seller list. Can't recommend this one more highly - you will be left empowered and inspired to face the inevitable challenges that many face when it comes to being a parent. When it comes to translating contracts, patents, and legal documents the ‘precision of terms and concepts’ is utterly crucial. The subject matter is usually professional translation delicate and large sums of money are often at play. You'll additionally read their social sites to induce a much better plan regarding the corporate. additionally to word services, for more information click here Professional Translation.